It’s fair to say that Playtech have a fondness for Ancient Greece and Age of the Gods Goddess of Wisdom is yet another five reel, three row and 20 payline slot which borrows from the Greek pantheon for its theme. On this occasion it is Athena, the goddess of wisdom, who gets her very own game featuring the perennial Age of the Gods link to four progressive jackpots, impressive payline payouts and fun free game modes. Although already well explored by Playtech, the Ancient Greek theme of Goddess of Wisdom still remains fun and interesting. A generous top payline jackpot that can be worth £250,000 and the connection to four progressive jackpots give players multiple opportunities to strike it lucky. Huge variety is provided in terms of stake amounts per spin, to suit players of all budgets. Free game modes give players a choice between a number of different features that can help to boost winnings impressively. Compared to other Age of the Gods titles, the additional features of Goddess of Wisdom manage to be at once both a little disappointing and quite tough to understand. Progressive jackpots – which we will discuss later – aside, players win the biggest possible jackpot through Goddess of Wisdom when five of the slot’s mask symbol line up along one of the active paylines. That five mask symbol combination pays out at a rate of 5000 times the player’s chosen line bet. At the beginning of each spin, players can chose their line bet and the maximum possible level is £50. That means that if the game’s most valuable payline combination results when that line bet level is selected, the jackpot will be worth an impressive £250,000. Alongside boasting that generous top payline jackpot, Goddess of Wisdom also offers players a number of additional game features. These are a link to fully four different progressive jackpots, wild symbols and scatter symbols which trigger free games. All of Playtech’s Age of the Gods titles are linked to not one but four different progressive jackpots and Goddess of Wisdom is no exception. 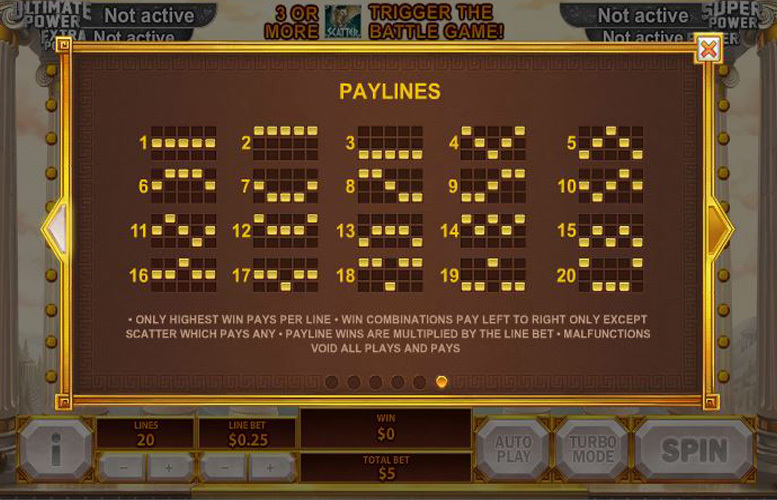 A player can randomly trigger the jackpot game, which will see them win one of the jackpots, at any time. Whether they win the Power, Extra Power, Super Power or Ultimate Power jackpot, however, is decided by the choices made by the player during the jackpot game. Introducing a way for players to enhance their chances of winning payline combinations, the Goddess of Wisdom wild symbols can appear on reel two, three or four. As and when they do appear, the symbols substitute for all other symbols – apart from the scatters – in order to produce the most valuable possible winning combination. 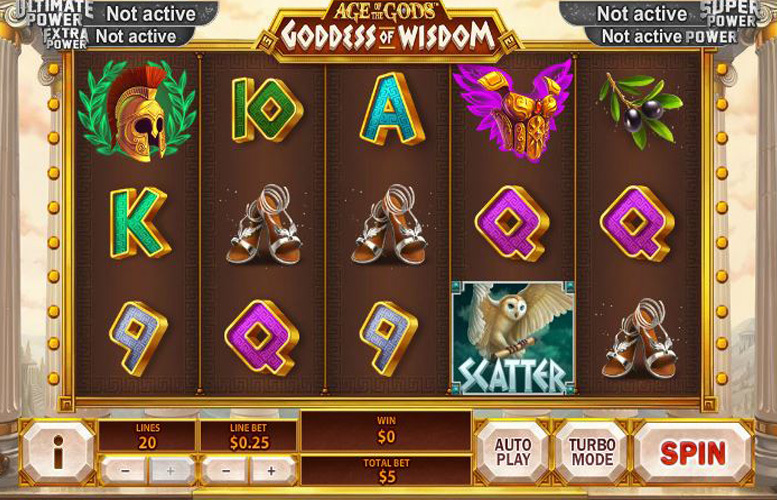 The Goddess of Wisdom slot also includes scatter symbols, which can appear on any of the game’s reels. When two or more appear at once, an instant win is triggered and when three or more are shown on the reels, players must then choose one of three of the game’s symbols through a ‘battle game’. The chosen symbol will then replace the other two on the games reels for a set of free games and the choice of symbol determines how many of those games there will be. If the mask symbol is chosen, for instance, there will be ten free games. If the helmet is selected, seven free games will result but they will all be subject to a four times multiplier. 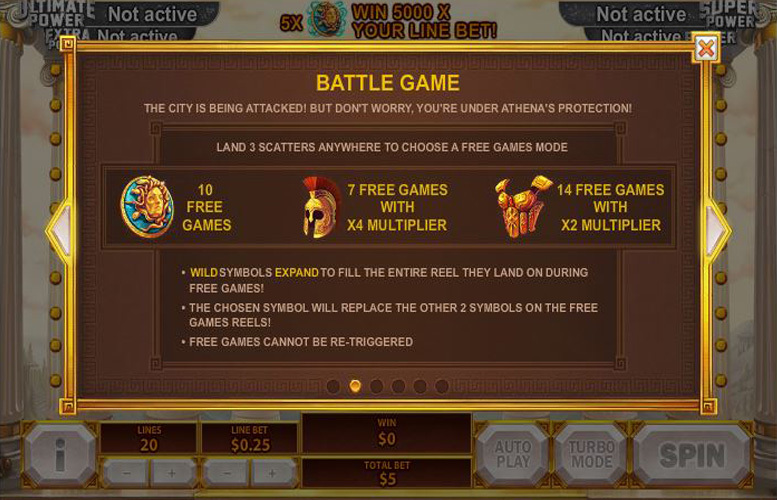 If the breastplate is chosen, finally, there will be a total of 14 free games all with a two times multiplier. The difference in the free games triggered when each of those symbols is chosen, makes sense when you understand the relative value of each of the symbols on the slot’s reels. They are, after all, the game’s three most valuable symbols when it comes to payline combinations. As we’ve already mentioned, the mask symbol returns a jackpot worth 5,000 times the player’s line bet when five appear along a payline. When five of either of the other two aforementioned symbols helmet or breastplate) appear, meanwhile, the jackpot will be worth 1,000 times the bet per line. Goddess of Wisdom really impresses when it comes to the range of staking options which players have to choose from for each of their spins. They can, after all, alter both the number of active paylines for any spin and the size of their bet per each of those paylines. Anywhere from a minimum of one to the maximum of 20 paylines can be made active for each Goddess of Wisdom spin. There are then also a huge variety of different line bet options offered between the minimum possible 1p and the maximum of £50, meaning that players can bet anywhere between 1p and £1000 per spin. Of all of the Age of the Gods slot titles, Goddess of Wisdom is the one which will perhaps appeal most to those players whose biggest consideration when selecting a slot is its payout potential. The game, after all, includes a number of features that boost that potential but which are perhaps not quite as interesting as those found with other similar slots. 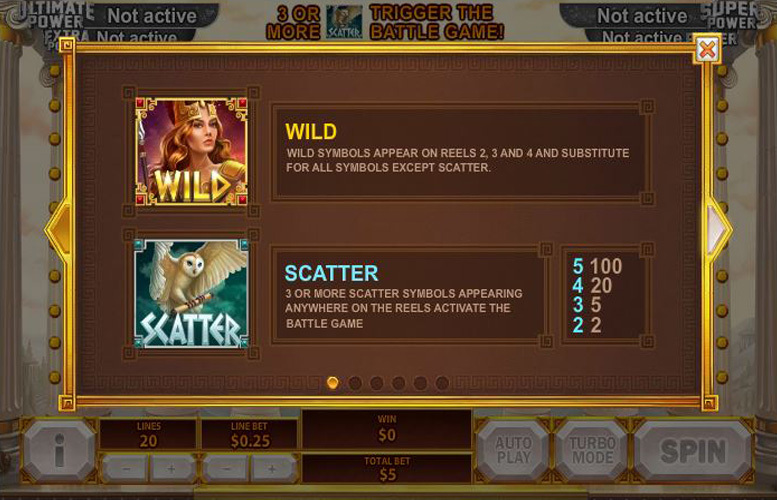 Wild symbols and scatters are each featured on the reels and help to either enhance or to offer extra jackpots. What’s more, selecting one of the game’s symbols after three or more of the scatters appear is a way for players to choose one of three different free game modes. All of those features, therefore, help with winnings but do not add much in terms of gameplay beyond the slot’s main game. What Goddess of Wisdom does do better than most of the other Age of the Gods titles, however, is offer great staking options. All in all, then, players of all budgets who want a good chance of winning it big will love Goddess of Wisdom. This game has a rating of 4 / 5 with 356 total reviews by the users.